Isn’t bowing to a ‘Book’ the same as idol worship? What makes you different to Hindus? As for the argument that bowing to Sri Guru Granth Sahib jee is idol worship, I would ask, what is idol worship? Bowing to a stone that can teach nothing is idol worship. A Sikh prostrates to God alone. Satguru Sri Granth Sahib jee is the ‘Spoken revealed Word’ of God. There is no difference between the Order and Word of God and God Himself. Bowing to Sri Guru Granth Sahib jee is a sign of submission before the Word of God. It is not worshipping the physical body, be it the Granth (Scripture) form now or when Guru Sahib was in human form the human body, it is a submission to the Shabad (the Divine Infinite Wisdom). If there was a Granth with identical physical characteristics as Sri Guru Granth Sahib jee, a Sikh would not bow to it because it does not have the Shabad. Idol worship can only be true if there is in fact an idol. What is being worshipped is the Shabad, which is the revealed Order/Instructions/Word of God and that which offers enlightenment. The Shabad is by no means an idol. Therefore, bowing before the ‘Spoken revealed Word’ of God and submitting to God’s Order is in fact bowing to God. This is clearly different to the stone idols of Hindus, which they worship, bow to and circumbulate seven times, and Muslims who bow to the Kaa’ba and revere the black rock, which they worship, kiss and circumbulate seven times. Now consider what is idol worship and what is worship of God alone. « What is the Sikh view on Jesus being the only Son of God? I came across this wonderful website and was reading some very fascinating articles. 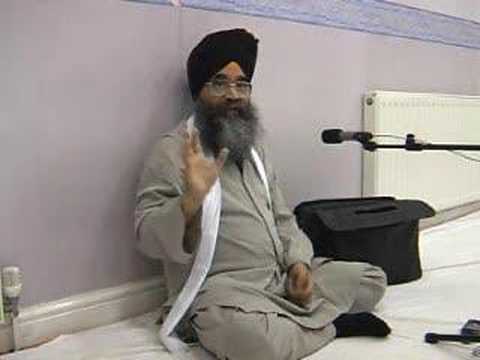 I was impressed by the following quote: Satguru Sri Granth Sahib jee is the â€˜Spoken revealed Wordâ€™ of God. I could not find any detail of this, so could you please tell me how and when God revealed the truth and to whom. Sikhs believe that God spoke through the 10 Sikh Gurus. The same Light is enshrined in Sri Guru Granth Sahib Ji. For Sikhs, Sri Guru Granth Sahib is the Living Word and God speaks to them through this Timeless collection of God’s Revelations.